Yarn and Fiber Happenings: Heavy/Warm Shawl Workshop with Galina Khmeleva at Yarn and Fiber Company! Heavy/Warm Shawl Workshop with Galina Khmeleva at Yarn and Fiber Company! How beautiful is this shawl!!!! Wanna make one? Me too! Come and join us on July 19 and 20th from 10-4 for a weekend workshop with Galina Khmeleva. Give us a call at 603-898-5059 to reserve your seat or email me at cyndi@yarnandfiber.com. I have copied the class write-up below. Call soon, space is limited and the seats are flying! Heavy/Warm Shawl Workshop with Galina Khmeleva at The Yarn and Fiber Company! Join in the fun! There is something to be gained in this class by everyone! New lace knitters can easily break into working on gorgeous lace shawls through Galina’s expertise and expert lace knitters will enjoy the new techniques and tips / tricks they will gather during the class that come straight from the Russian Orenburg lace knitter community. Everyone leaves as a more experienced lace knitter with a beautiful shawl underway. Come and enjoy the weekend with us! Knit a luxurious heavy/warm shawl the unique Orenburg way from Galina A. Khmeleva, author of Gossamer Webs, The History and Techniques of Orenburg Lace Shawls and Gossamer Webs, The Design Collection. 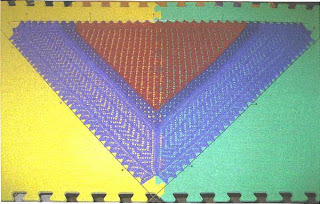 The construction of the classic warm shawl uses an entirely different knitting technique from that of its close, lacey relative. This spectacular “cousin” to the elegant, traditional Orenburg gossamer lace shawl made famous by Russian babushkas, will make a superb throw, baby blanket or comforter. Please call us to reserve your space at the learning table. Full payment of class is due upon registration for class – refunds for class will be allowed up to one week prior to class start.